Summary: As of March, 40% of the country's financial institutions registered nearly 4,900 dot-bank domain names. Why are so many banks migrating their sites? If you feel like you see more drones today than ever, you are right. 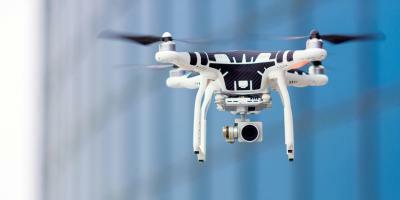 Drones are also expected to increase even more over the next few years. According to the Federal Aviation Administration (FAA), sales of drones are expected to grow from 2.5mm in 2016 to 7.0mm in 2020. Given this surge in growth, the government is working to get all drones registered. As you think about the growth in drones, we switch now to the growth in dot-bank websites. There's been a significant uptick this year in the number of community banks migrating their internet domain from dot-com to dot-bank, as new resources and more third-party vendors' sign on to help banks make the dot conversion to a more secure domain. As of March, more than 2,400 banks representing more than 40% of FDIC insured financial institutions had registered nearly 4,900 dot-bank domain names. More than 300 of those names are now actively being used. For years, banks could only choose the language to the left of the dot for their websites and email addresses. Now, you are able to also choose the extension to the right of the dot (known as the top-level domain). In 2014, fTLD Registry Services LLC was awarded the right to operate the .BANK and .INSURANCE generic top-level domains by the Internet Corporation for Assigned Names and Numbers (ICANN). ICANN is the organization responsible for coordinating unique identifiers across the World Wide Web. For their part, fTLD is a coalition of banks, insurance companies and financial services trade associations from around the world. Their mission is to operate a trusted, verified, more secure and easily-identifiable online location for these financial companies and their customers. The dot-bank domain has security requirements that exceed those of most existing and new top-level domains. It also provides new marketing and branding opportunities because it opens up much needed real estate on the internet, fTLD says. More community banks are offering up testimonials about migrating to dot-bank. The chief executive of a MA bank says the new domain confirms that the community bank is looking out for the security of its customers and identifies the institution as a proactive leader in banking and in its community. The new domain also gets a nod of approval from a Federal Reserve official, who writes on the central bank's Community Banking Connections blog that it should be much more difficult for a criminal to establish a spoofed bank website (where online criminals masquerade as a bank) with a dot-bank extension. That's because only banks chartered and supervised by a state or national government regulatory agency can qualify and only after they have been vetted by Symantec and approved by fTLD. Moreover, internet service providers (ISPs) can flag spoofing e-mails, because the would-be thieves can only use dot-com domains. ISPs will also be able to catch the discrepancy if crooks try to spoof emails from institutions with dot-bank domains. This year has seen a marked rise in the number of financial institutions making the switch from dot-com to dot-bank, because more third-party vendors are now helping institutions set up their websites and email using their new domain in a way that complies with fTLD's security requirements. To start, you can review fTLD's guides, research reviews by outside sources and conduct other due diligence. Then, your bank may very well decide that dot-bank is a viable option to offer greater security to your bank and your customers. So, the next time you look into the sky and ask whether it is a bird or a plane, it might just be a drone or a dot-bank flying by. Yields slipped 2bp despite positive economic data. SimilarWeb research finds customers of Bank of America that used its mobile banking app were on it for a daily average of 8 minutes and 14 seconds. This compares to 8 minutes, 7 seconds for JPMorgan Chase and 7 minutes, 3 seconds for Wells Fargo. A Bank Director survey of directors and executives finds banks that said they needed to improve the compensation package for the CEO to retain them and/or attract future CEOs identified the following as the primary ways to do so: offer equity stock options, restricted stock or some other form of ownership interest (67%), consider other forms of compensation including non-equity long-term incentive compensation or executive retirement benefits (56%), pay a higher salary (39%) and offer equity at greater levels (22%). US Bank reports it has seen a 104% increase in Zelle transactions in the past 4 months and a 50% increase in customer enrollment in P2P offerings over the same period. Zelle is integrated into existing mobile banking apps and is a bank solution targeting Venmo. Both Zelle and Venmo let customers make payments to each other's bank accounts using their phone. Ovum research finds 56% of US banks are actively developing application programming interfaces (APIs) that will allow customer data to be accessed and shared with third party developers and others. This compares to 100% of Canadian banks and an aggressive push in Europe to do so as well.